Charge and Sync your Apple Lightning-equipped devices with reduced clutter. The USBLT15CMW 6in/15cm Lightning to USB Cable for iPhone, iPod and iPad enables close-range syncing and charging of your Lightning-enabled mobile digital devices. The cable is short enough to minimize the clutter of excess cable, making it ideal for charging your device in your vehicle or syncing to your laptop. 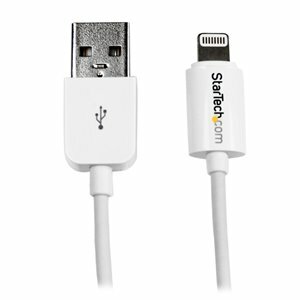 Plus, the shorter cable design provides a portable solution that makes it perfect for carrying as a tablet or laptop accessory.The reversible 8-pin Lightning connector can be plugged into your iOS-enabled device with either side facing up, meaning there is no wrong way of inserting the cable into the device.This durable cable is Apple MFi certified.